﻿ Climate Change and EU Security: When and How Do They Intersect? Climate Change and EU Security: When and How Do They Intersect? The original version of this article, by Gerald Stang, appeared on the European Union Institute for Security Studies (via the International Relations and Security Network). The potential security challenges linked with climate change can make for great headlines. While sensationalist claims about water wars, states collapsing in chaos, or the forced migration of hundreds of millions cannot be completely discounted for the long term, intelligent mitigation and adaptation efforts can help avoid the worst of these – and manage the rest. Planning these efforts, however, requires that the likelihood and time frame of climate change impacts are well understood (as much as they can be); that security challenges associated with these impacts are placed in their proper context; and that resilience mechanisms, including security and defense systems, are appropriately organized to withstand potential shocks. And while much analysis is necessarily focused on potential climate-related threats abroad – climactic stressors that can change the calculus of potential conflicts in far-off lands – climate change will also impact security and defense considerations closer to home. While Washington is often seen as slow to respond to the challenge of climate change, the surprise announcement of a joint climate accord between China and the U.S. signifies agreement between the world’s two largest carbon emitters (and major geostrategic competitors) on the need to share the burden of emission mitigation. It has shown that, despite discord in Congress, the American executive branch takes climate change very seriously and retains the capacity to take significant action. The American security establishment has also been quick to incorporate the potential risks of climate change into its strategic planning. The recent release of the latest version of the Climate Change Adaptation Roadmap by the U.S. Department of Defense highlights the potential impacts of climate change on the department’s infrastructure, logistics support, training, and operations. A few months before, a group of retired U.S. officers produced a paper for the CNA Corporation, a U.S. Navy-affiliated research organization, taking a broader view by looking at the threat of climate change to the political, military, social, infrastructure, and information systems that constitute American “national power.” Climate change has clearly become relevant for the strategic thinking of the US intelligence and defense communities, moving beyond its status as a mere environmental issue. Continue reading on the International Relations and Security Network. Sources: CNA Corporation, U.S. Department of Defense. 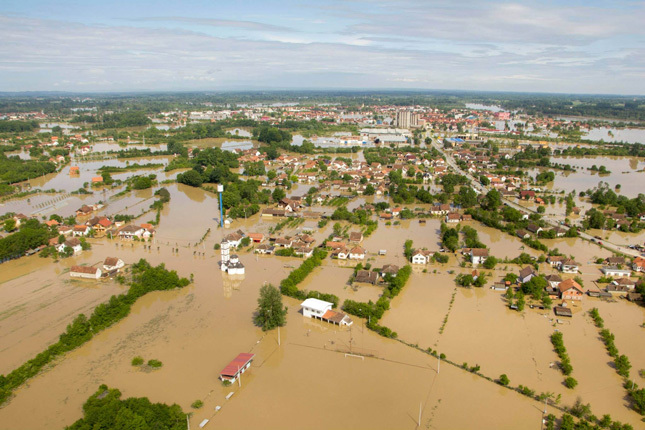 Photo Credit: Flooding in Bosnia and Herzgovina, May 2014, courtesy of the European Commission.